Living in New York City, London or Paris is an adventure of self-discovery. You will gain years of experiences in one month. It is a lifestyle choice. Living in New York City for a month is easy; however, being able to spend enough money to enjoy New York is the problem. Travel is a list of questions first, and then a list of answers. 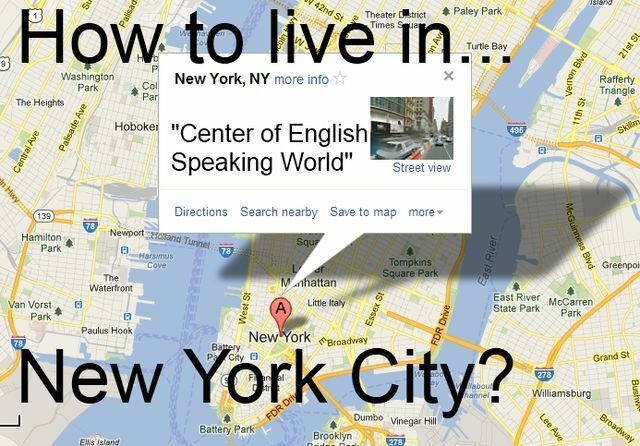 Traveling to New York City means we need to be extraordinarily specific with questions. Who? – Who am I? Am I a 22-year old wanting to party with young folks and spend all night out dancing? Or am I a retired person wanting to walk around New York Central Park? At the end of the day, living in New York City is going to be about the people you meet and who you are. Who is the person you want to be in New York City? When? – Which month? Living in New York City in January would be cold, while July would be hot. And during the summer high-tourist season in New York City, it can cost more for room. But public transport in July could be cheaper. Also consider: Do you need to park a car? Where? – To enjoy New York City, it is helpful to narrow your desired living place to an easily defined neighborhood, something you can write in Craigslist, for example, I want to live within 20 blocks of the Smithsonian Institute. After years of roaming around the planet, one slowly learns that “why,” “what,” and “who” are very important. When we learn the answers to those three questions, the “where” is figured out. But we need to be able to say the “where” in one sentence. Why? – New York City is the center of the planet; it is, in many ways, the center of the Universe as we know it. In the past, it was London, then before that, Paris, then before that, Rome, and in the future, it could move to Beijing, China. New York is the hub of world business; therefore, there are many business reasons to live in New York City. “Why live in New York City?” is a difficult question. And New York City is a cultural enigma, just as any large metropolitan city, such as London, Los Angeles, Chicago or Paris. People assume that everyone needs to go to New York and should want to go to New York. But the ultimate question for you is, why do you want to go? But more important, what do you want to do? What do you want to buy? Which places do you want to visit? Seeing the Statue of Liberty is a great experience, but it does not take a month. What? – What are you doing to do for a month? How? – How will you spend your days? New York City and other large cities are time vampires. Going to meet a person can take an hour of travel and an hour to return, and $20 dollars just for transportation. And, in many ways, New York City is the most dangerous city on the planet for travel. If you accidentally go into the wrong neighborhood, one of the boys may bop you on the head. How Much Money Will You Need? – The “who,” “when,” “where,” “why,” “what” and “how” are going to answer the question of money and whether you can afford to enjoy the place on the money you want to spend. Now, How Would I, Andy Lee Graham, Go to New York City? This is 100 percent possible in any city on the planet, whether you call it a boarding room, or a language school with rooms. There is always an extra room that is not being used, and if the person likes you, they will let you sleep there for a month. When I was in Europe one time, I met a man who would walk into the corner bars of the world and scream: “I want a room for a month; I am a chef! Who has a room for me?” For years, this man had lived for free, traveling the world slowly. There is always a way if you have time, patience and are good person. There is always a room open for a good guest, even in New York City. I was offered an apartment in Paris for $300 per month, but I turned it down. I wanted to go here, where I am now, not there. I am not crazy; I am fully aware of what makes me happy, and often, saying no is the secret to travel happiness. Andy Graham … in some exotic city, outside the USA. … Log in to find out where!